General Motors' assembly plant is Oshawa has a mix cars on the line at any one time. Staying flexible keeps the plant relevant and running. For example, when the plant lost the Chevrolet Camaro, it didn't close. 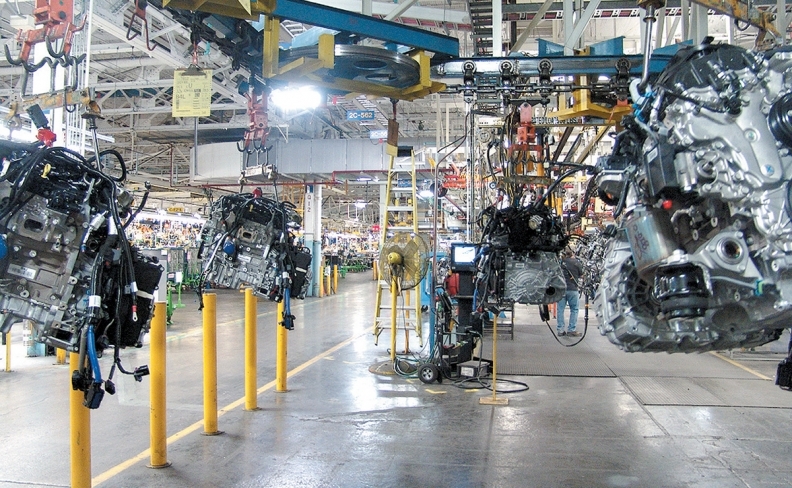 Compared to other countries,Canada continues to lose ground in autoassembly capacity. But curiously, there is increased activity by Canadian companies involved in progressive automotive technologies. Looking at the bad news first, Canada's peak year for auto assembly was 1999 when more than three million vehicles rolled off assembly lines in places like Oshawa, Oakville, Windsor, Brampton, Ingersoll, Allison and Cambridge, Ont. In 2014, the total was down to 2.4 million. At one time Canada was the fourth largest assembly country in the world. Ray Tanguay thinks Canada is at a crossroads where it's critical to show leadership in research and development. "Now we're 10th, and over the next few years, we'll drop to 11th and 12th, as other growing and developing economies pass us as well," says Anthony Faria, professor at the Odette School of Business, University of Windsor, Ont., who tracks declining investment in Canadian auto plants. The importance of assembly facilities and their well-documented ability to create "spin-off" jobs in Canada continues to dominate the auto industry conversation. Michigan's Center for Automotive Research (CAR) now estimates that every assembly job creates another 10 jobs in the economy. The number was recently raised to 10 because more content is now packed into all vehicles, and suppliers generally build this content. According to Industry Canada, about 40,100 people are directly employed in Canadian auto assembly plants, while about 81,300 are directly employed in autoparts production. Applying a multiplier of 10, the total of all jobs launched from current Canadian vehicle manufacturing assembly could well be more than 400,000, though not all those jobs would be contained within Canadian borders. If there's an opportunity to expand Canada's auto industry outside of adding assembly capacity, it is in research and development, said Faria. 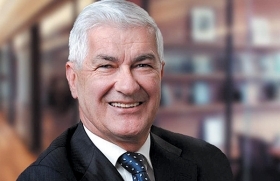 Whenever Canada's "auto czar" Ray Tanguay discusses Canada's auto industry strengths to encourage more auto investment from automakers, he never fails to mention the country's ability to deliver automotive research and development. "It's almost like a calling card," says Tanguay, a former senior executive at Toyota Canada who heads a new federal provincial automotive investment committee intended to advise the Canadian and Ontario governments on auto policy going forward. "If you can show you can innovate and have the intellectual and engineering power, it shows you can support the whole infrastructure needed for auto manufacturing." Tanguay says this is an important juncture for technology, one that Canada could leverage to its advantage. Environmental concerns and priorities as raised during the recent Paris summit on climate change, and the inevitable run to the connected and selfdriving car, will require lots of automotive technology brain power over the coming years, and lots of Canadian companies and institutions are already proving they have such technical capacity. It's estimated that for every manufacturing job that Canada loses to other countries, 10 more follow. 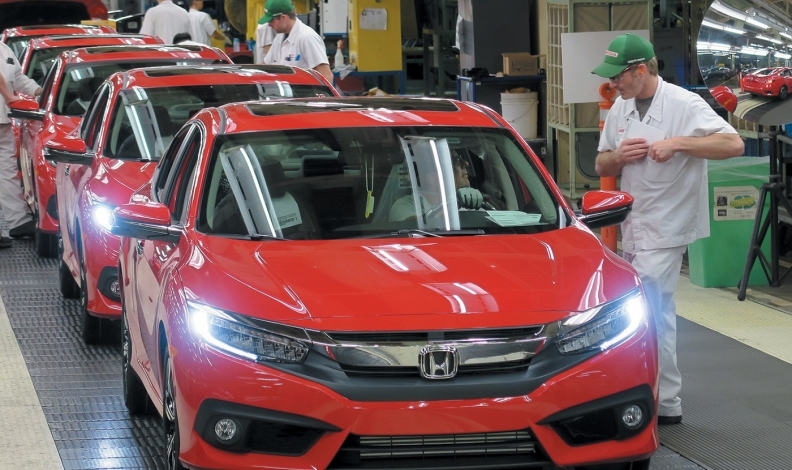 There are still pillars in manufacturing such as the Honda plant in Alliston, Ont. "The whole extent of the autoparts industry as it exists in Canada is only here because of the automotive assembly plants we have here," says Faria. "It's the reason that other political jurisdictions provide the incredible level of incentives they do to attract new automotive assembly facilities." With the industry rationalized in North America, there is opportunity for domestic-based parts builders to also build parts for non-domestic assembly plants. Faria notes that Canadian parts plants do export parts, but they run up against just-in-time delivery requirements, which work best when suppliers are located virtually next door to the assemblers. He points to the example of Magna's Integram facility in Windsor, a virtual extension of FCA's Windsor Assembly Plant that assembles the Chrysler Town & Country and Dodge Caravan minivans. Every day the minivan plant operates, Integram makes the exact seats to match the exact minivan models coming down the line. Trucks leave Integram every hour and when the seats arrive at FCA, they are moved directly to assembly. According to the latest StatsCan figures, 94 per cent of Canada's autoparts exports go to the United States. Three percent goes to Mexico. Regaining Canada's top-five auto assembler status seems as daunting a task as GM trying to regain the 40 percent market share it enjoyed in the early 1980s. In both cases competitors have moved in, matured to become major players, and are not going anywhere. Lastly, Tanguay says that it is 19-percent cheaper to do research and development in Canada compared to the United States, due to government-incentive programs for R&D, the low Canadian dollar and an engineering labour force that can get it done without the need of imported expertise.